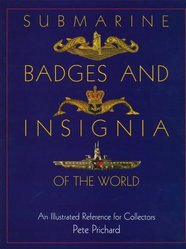 This book is a complete compendium of the submarine badges of the world, dating from the Imperial Russian Naval Officer's Submarine School Graduation Badge of 1909 to the new South Korean Submariner's Badge issued in 1996. It covers all countries currently operating submarines as well as those no longer existing as political entities. With over 400 illustrations in colour covering over 50 countries from the inception of their submarine forces to date, this book is the most complete reference available. It is a must for the collector, those interested in submarines or uniforms, and the military historian, professional or amateur.